Before it was a film, and before it became a classic television series, Dragnet started out as a long-running radio show, airing from June 3, 1949, to February 26, 1957. 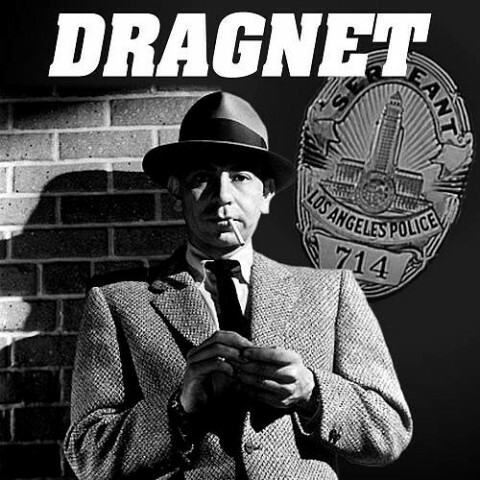 One of the most influential crime drama shows from the 50s, Dragnet was the brainchild of Jack Webb, the actor, director and screenwriter who played the lead role of Sergeant Joe Friday. We best remember Joe Friday imploring female informants to provide "Just the facts, ma'am." But, in actual fact, he never uttered precisely those words. "All we want are the facts" is what he really said. But I digress. Thanks to Archive.org you can now travel back to the 50s and listen to 298 episodes of the show, which was known for its realistic depiction of police work -- the boredom, the drudgery, the danger, the occasional acts of heroism, and everything in between. Note: There were 314 episodes in total. And Archive.org does not house the very first episode called "Robbery," which first aired on June 3, 1949. That's available here. That is the second episode, commonly mis-labeled as the first. This is a really good radio/show. Thank you for this really neat website!